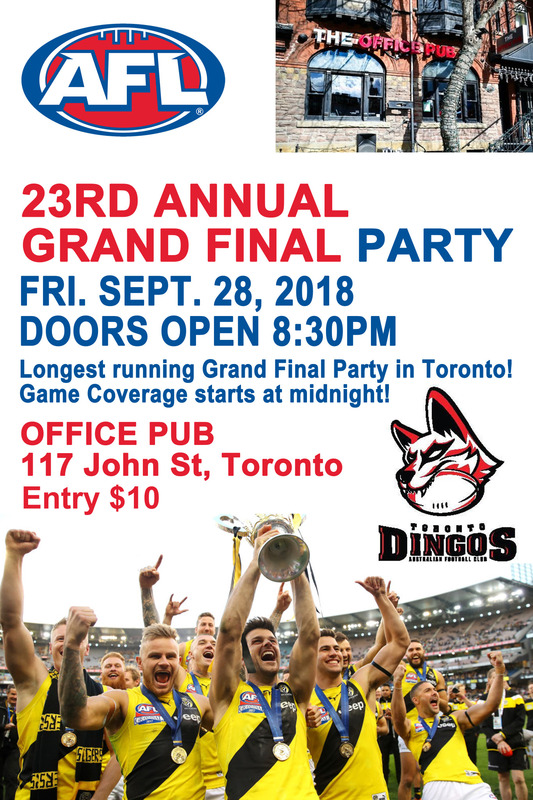 The Toronto Dingos Australian Football Club will host its 23rd annual AFL Grand Final party on Friday September 28 at their sponsor pub The Office Pub on John Street. The annual party is historically the longest serving Grand Final party in Toronto and continues to draw large crowds every year. The Grand Final party is one of the big fundraising events for the Toronto Dingos Football and draws more than 350 patrons through the door, all looking to enjoy the footy on the 20+ screens. PRIZES: We have our major raffle draw ($5 a ticket!) with prizes such as Leafs gear, Blundstones, Jays Flex Pack, Raptors v Melbourne United tickets, and prize packs from Kanga Pies, Down Under Travel and a bar fridge from The Office Pub. Tickets for the major draw will be sold at the door on the night. Also, before the match there will be heaps of prizes up for grabs and competitions to be part of such as first goal, best on ground and lots of door prizes. ENTRY: $10 will get you in the door. GAME: Coverage starts at midnight. The Office Pub will be playing a mix of AFL highlights/Grand Finals before the main game. There will be many current and past players and family members of the Toronto Dingos Football Club present who will be at the door and around the event. So if you’re interested in having a kick in 2019, please ask one of them for more details or contact coach@torontodingos.ca and direct it to head coach Mike Karas.